Catch up on the Season 7 premiere of Call the Midwife. Warning: spoilers ahead. Surprise! The midwives keep finding their way back to us, and just when you thought you’d have to wait a long, agonizing week to catch up with them, “Call the Midwife” gifted us with not one but two episodes to kick off Season 7. We’re feeling #blessed. In case you missed it, here’s what went down during Episode 1: Nonnatus House introduced a new face with the arrival of midwife Lucille Anderson, and to say that she’s had a rough start to her job is quite the understatement. Filling the vacant role left behind by Barbara, Lucille arrived to Poplar with a bladder infection in the middle of a blizzard. With a dwindling staff at Nonnatus House, she was forced to prove her skills under pressure, despite her illness, as she and Trixie dealt with a precarious breech delivery. Not to mention, she’s had a rocky start to her relationship with midwife veteran Sister Monica Joan, which is clearly the worst part of all of this. Perhaps a cake offering is in order? Now, Lucille faces a new obstacle as she’s met with racial prejudice while calling upon her most recent patient Marjory Chivvers. 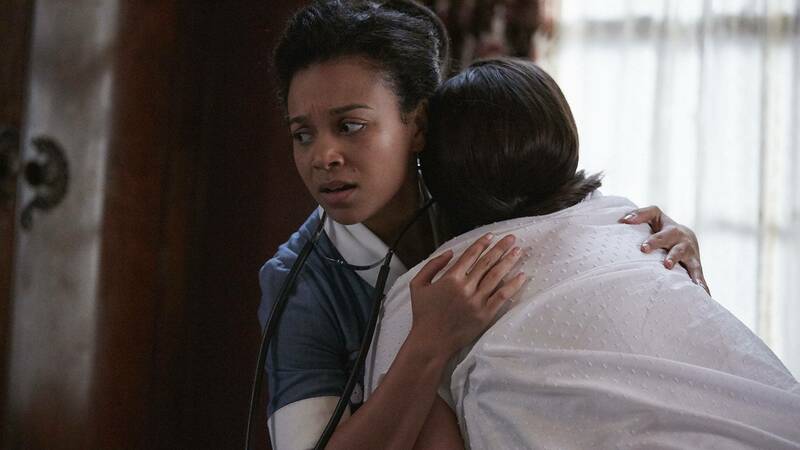 Though Marj has no qualms with her new midwife, her mother Mae Stanton is visibly skeptical of Lucille being the on-call nurse and expresses her concern to Valerie about leaving Marj alone with Lucille. While Lucille copes with the burdens of racism in Poplar, things are heating up in Trixie’s world with Dr. good looks Dockerill. Delivering babies? That’s old news. Settled in her career as an OG Nonnatus House midwife, Trixie has started looking toward the future as her relationship with Christopher levels up. From their first vacation together to homemade dinners, marriage is the next logical step, right? With a new midwife and blossoming relationships, signs of change are heavily present within the house. In a progressive move, Sister Winifred suggests that men be able to attend mothercraft classes with their significant others. Supportive men assisting with childcare duties? Amen. To. That. Though life has been relatively quiet in the Turner household (after all, they went through hell and back with the events of Season 6 and Shelagh’s miscarriage scare), Shelagh has brought in a new recruit to help her care for the children and to live with the family full-time. Dr. Turner is initially thrown by the idea, but little do they both know Shelagh will be the one with babysitter regrets. Back at the Chivvers’ home, the tension between Mae and Lucille grows when Lucille becomes Marj’s primary caretaker. Openly vocal about her feelings, Mae pulls Valerie into the middle of the conflict, remarking on a rumor she heard alleging Lucille wasn’t actually a trained midwife. Picking up on coded language, Valerie is quick to put Mae in her place, however, and reminds her that Lucille is just as qualified as any of the other midwives from Nonnatus House. Shut it down, Val! Although Valerie makes a valiant effort to sway Mae’s opinion, an unfortunate incident only encourages Mae’s distrust of Lucille. The day after Valerie and Lucille help deliver Marj’s baby, Marj begins to experience an intense pain through her head and ultimately loses control of half of her body. Lucille, with her expert training, quickly identifies Marj’s symptoms as those of a stroke. As the women come to terms with Mae’s diagnoses, the Turner family welcomes their new au pair to their home. When Dr. Turner arrives with Magdalena, Shelagh takes note of the shocking difference between the woman before her and the photo she received — this is no Nanny McPhee. She later confesses that she feels she’s made a mistake bringing such a young woman into the house, and while she’s referring to Magdalena acting as a distraction to Timothy, Dr. Turner misconstrues her discontent for concern that he might have a wandering eye. Men. They always think the song is about them. He is quick to dismiss the notion regardless, and assures Shelagh that Magdalena’s presence will be useful to the family. Upon returning to her hair salon, Mae overhears her clients gossiping to one another. It’s implied amongst the women that Marj’s stroke was a result of Mae scheduling her to work throughout her pregnancy. We see guilt set in when Mae later encounters Lucille at the clinic, projecting her anger at herself toward Lucille. She exclaims to the room of horrified onlookers that Marj had a stroke because she didn’t have a “proper English midwife” to look over her before storming out. In order to spare Lucille’s feelings and any more hardship under Mae’s scrutinizing eye, Nurse Crane and Sister Julienne attempt to remove Lucille from her midwife duties with the Chivvers. Lucille takes her case directly to the top and insists that Marj’s removal from her care will only encourage Mae’s bigotry and convince her that her racial slurs and actions were justified. After making a convincing argument to Sister Julienne, Lucille braves Mae’s wrath and returns to the salon to carry on with her job — because your girl gets things done. She stands strong and defends herself but also shows Mae kindness, reassuring her that she knows Marj’s stroke isn’t Mae’s fault either despite the rumors that have been spreading around town. Instead, she calls it for what it is — a mysterious event that neither of them had control over. Mae seems thankful to Lucille for setting the record straight before her clients, so she allows Lucille to continue with her care over Marj. And with this, Lucille’s actions set off a domino effect. Dennis Chivvers joins Lucille in National Stick-It-To-The-(Wo)man Day. Dennis stands up for himself and shows both Marj and Mae that he can step up to be Marj’s main support system. In doing so, he showcases he’s not the passive and dependent husband he once was. Crossing one’s in-laws typically doesn’t go over well, but a shocked Mae relents to this and Marj, who is unable to speak for herself, reveals a sign of relief and approval. Valerie Dyer is a funny, feisty girl, who comes from old Poplar stock.